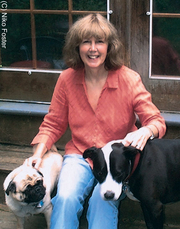 Susan Meddaugh is an American children's book author and illustrator. Born in 1947 in Montclair, New Jersey, she was educated at Wheaton College, where she studied French literature and fine arts. She is perhaps best known for her series of picture-books about Martha the talking dog, which served as the basis for the animated television series, Martha Speaks. Susan Meddaugh is currently considered a "single author." If one or more works are by a distinct, homonymous authors, go ahead and split the author. Susan Meddaugh is composed of 4 names. You can examine and separate out names.